How to play the Board game "Business class"
How to play the Board game "Millionaire"
Board game "Business class" was developed in 2003. This game will be interesting for those who are embarking on the serious study of matters of business. 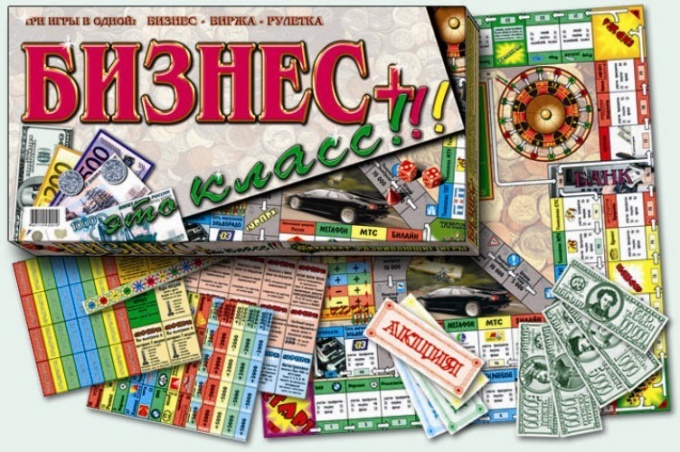 Before the game randomly chooses: the banker (gives the initial capital), a broker of exchange (keeps the stock card), the tax inspector (at the end of the financial year collects and delivers to the Bank the property tax at the rate of 10%), a dealer (taking bets on roulette, winnings gives tokens). The game begins with the one who is after the throw of the first dice will fall more. The beginning of the game all contestants will start at station No. 0. The playing pieces are moved on the playing field arrows. At sites 9, 16, 44 and Highway 10, each player can arbitrarily choose a direction. The player throws two dice and moves his token the number of plots is equal to the sum of the dropped points. If the dice after the throw stayed in position, not allowing to clearly define the top face, it is believed that had the zero. If both dice stayed on the edge, the player loses a turn. The aim of the game is to buy all eight lots one (any) color and build up businesses. The first player that performed this task is an absolute winner (Tycoon). Bankrupt (bankrupt) out of the game. If the game ends early, the winner is determined by the maximum assets (sum of cash value of whole property and all stock). One move in the game is equal in time to one month. Account time is the banker. Payment of tax occurs when all players will make 12 moves. The tax inspector should help the players count the value of their assets. Cash are considered to be easy. The total cost of the acquired sites and businesses, too (number of sites multiplied by 25 000 plus the sum of the values of the constructed enterprises). For calculation of the total value of the shares must be used starting value (five thousand), and current. Each player must pay taxes in the amount of ten per cent of all assets acquired in the past year. If the need for any payment to the player lacks the necessary resources, it is declared bankrupt. All of his assets are transferred to the Bank. The Bank pays all the creditors of the bankrupt the whole amount of his debts. Experienced players are encouraged to: take into account the dependence of the value of enterprises from the rate of shares at year-end to dividends on the shares to use the loans as the Bank and other players to introduce non-cash payments and more.